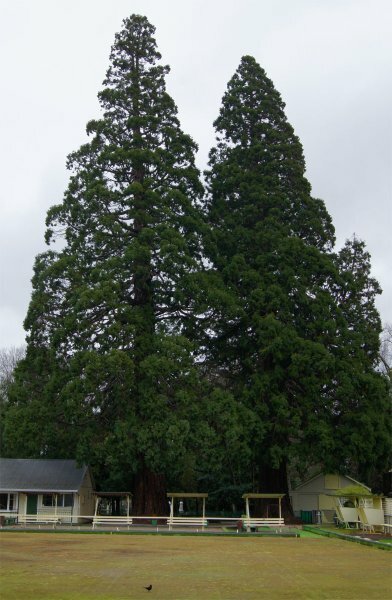 Largest and tallest of many giant sequioas planted in Queen Elizabeth Park, Masterton. 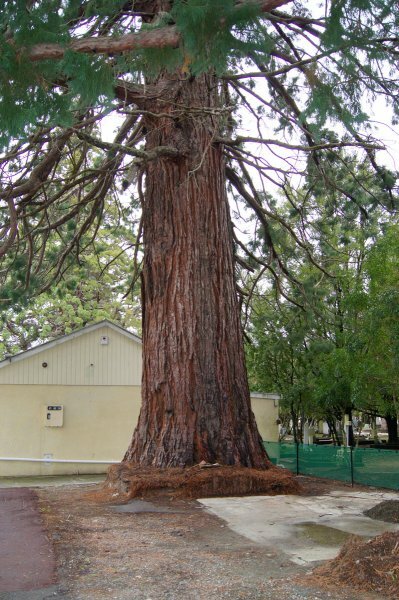 One of the other giant sequioas, planted in 1878, was felled in 1989 after storm damage. The stump of that tree has been preserved as a dendrochronological record of the park (Smillie 2011). 'When Masterton was surveyed in 1854 an area was set aside for "Public Reserve" on the site which is now Queen Elizabeth Park. However when the reserves were gazetted in 1861, Queen Elizabeth Park was included among the "Education Reserves". (Land from which revenue was generated to provide schools). As a result the land was leased and vested for rough grazing. In 1870 an attempt was made to set the land aside for public use, but it was not until 1875 that a successful petition achieved acquiring the land for the town. A publicly elected Trust was formed in 1877. Measured from top of surrounding mound to top of tree. Girth measured 1.4 m above level of small mound surrounding the tree, rather than the surrounding asphalt. Trunk splits into two leaders at approximately 40 m. Crown is slightly suppressed on one side due to neighbouring tree. 24 Jul 2011 Smillie, M.J. The tree is located between the park kiosk and the bowling clubrooms. Surrounded by other large giant sequioa, it is visibly the tallest tree.